Making an IT purchase decision can be difficult, especially with so many products to choose from, and with all of the untrustworthy reviews circulating the internet. What better way to decide which solution will be right for your organization than to find out what worked (or did not work) for other IT professionals? 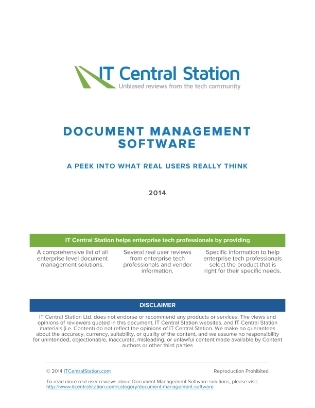 In IT Central Station’s 15-page premium guide, you’ll find a comprehensive list of all enterprise level document management vendors and products, candid discussions, and several real user reviews from verified IT professionals.